Be the first to share your favorite memory, photo or story of Mary "Lucille". This memorial page is dedicated for family, friends and future generations to celebrate the life of their loved one. Mary “Lucille” Palmer, age 94 of Plain, was lifted from her struggles with dementia on Friday, January 18th, 2019 while surrounded in love from her family. She resided at Brookdale Memory Care, in Sun Prairie and most recently under the care of Agrace HospiceCare. Lucille was born October 25th, 1924 to Joseph Klomann and Mary (Hagrety) Klomann in Chicago Illinois. She met and fell in love with her husband, Leslie Palmer, during high school dances. Following his time in WWII, they married July 28th, 1945. Lucille enjoyed time with family and friends at their dairy farm in Plain and their retirement home in Sun City West. Lucille was a member of the American Legion Auxiliary. She was a woman of faith, always volunteering in her church, and community. She loved to bowl, golf, swim, play cards on Friday night and dance. She was kind, loving and always opened her heart to everyone and took pride in providing for her family through her cooking and the gift of sitting down together for conversation and many laughs. Lucille loved her family and friends dearly and often asked God for “one more day” so she could be with them. Lucille is survived by her eight children Kathy (Dean) Tieszen, Mary (Will) Lemke, James (Deb) Palmer, Joan (John) Marshall, Bill (Linda) Palmer, Karen (Melvin) Crook, Robert (Barb) Palmer and Tim Palmer; 24 grandchildren, 47 great-grandchildren: sister-in-law Betty Nelson, and many nieces, nephews, and cousins. Lucille was preceded in death by her spouse, an infant son Leslie, her parents, her brother Bill Klomann, sisters Lorainne (Bill) Cagle, Dorothy (Bud) Uttich, Patricia (Glenn) Palmer, and Evelyn Klomann. as well as sister-in-law Dorothy Keglovich. 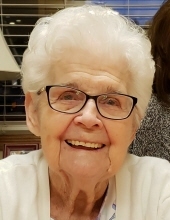 A Mass in memory of Lucille will be held on Saturday, January 26, 2019 at St. Luke’s Catholic Church in Plain at 11:00 a.m.. Visitation will be held on Saturday at the church from 10:00 a.m. until the time of the service. In lieu of flowers, the family requests memorial funds be sent to Agrace HospicCare, Fitchburg, WI 53711 or the Alzheimer’s Association, 225 N. Michigan Ave., Fl. 17, Chicago, IL 60601. The family would like to thank all the staff at Brookdale, special thanks to Autumn, Dana, and Julie. And to the dedicated staff at Agrace HospiceCare. Online condolences are available at www.staffordfuneralhomes.com. The Richardson-Stafford Funeral Home is assisting the family with the arrangements. "Email Address" would like to share the life celebration of Mary "Lucille" Palmer. Click on the "link" to go to share a favorite memory or leave a condolence message for the family.